Green cloverworm is one of many soybean defoliators in the Midwest. This caterpillar is often mistakenly called a looper, but differs in that it has four abdominal prolegs in contrast to three for loopers. 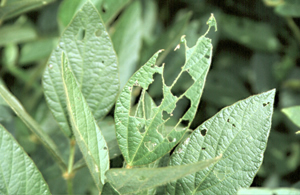 Green cloverworm is a sporadic foliage-feeding pest of soybean in the Midwest. Two or more generations may occur each year, and potentially destructive green cloverworm larvae may be found in soybean fields from late June through September. Newly emerged larvae are pale yellow and eventually turn light green in color. They have a narrow white stripe on each side of their body and four pairs of prolegs. A unique larval characteristic is their brief jumping and flopping activity that occurs when disturbed. Early instars skeletonize the underside of soybean leaves, leaving the upper leaf surfaces intact. Later instars assume the green color of the host plant, except for the two narrow white stripes along their sides. These later instar larvae consume all leaf tissue, leaving only the major veins and giving the plants a ragged, hail-damaged appearance. Green cloverworm larval populations usually do not reach damaging levels due to their susceptibility to attack by parasites and pathogens. 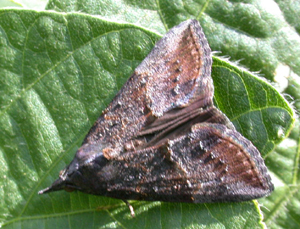 Parasitized larvae appear mottled brown and slightly shrunken with their bodies tapered at one or both ends. They are typically found attached to leaves. Some diseased larvae may be found dangling from leaves, their bodies having turned a powdery pink or white color. If during field visits, defoliation levels indicate that further sampling is necessary and numerous green cloverworm are present in the field, take 20 sweeps with a sweep net in each of 5 field areas. Determine the percentage defoliation level for individual plants in each sampling area of the field and estimate the average percentage defoliation level for the field as a whole. Also note any parasitized or diseased larvae found while moving through the field. These data will give a clue as to if the population is being significantly impacted by these natural controls. Additionally, record other foliage feeders (eg., bean leaf beetle, Japanese beetle, etc.) that are captured in the sweep net samples. Green cloverworm is especially susceptible to disease and attack by parasites, and populations are commonly controlled naturally without the application of an insecticide.